L’italiana in Algeri vs. La cenerentola | opera, innit? Posted on November 3, 2017, in italian opera, mezzos & contraltos, rossini and tagged gioachino rossini, l'italiana in algeri, la cenerentola. Bookmark the permalink. 9 Comments. 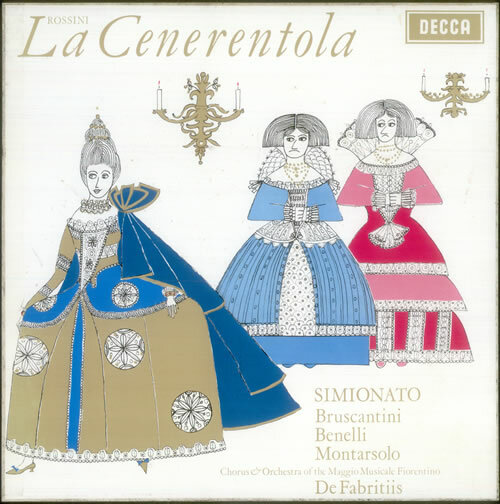 In MY opinion, L’italiana is indeed funnier, and has a better pace than Cenerentola, but the final rondò in Cenerentola is maybe the best funny aria that Rossini has ever written. And in fact he used it twice, also as the ending of Il barbiere di Siviglia. The first duet between Cenerentola and the Prince is also extremelycharming. But, alas, the step father, Don Magnifico has at least 2 boring arias (and I’m not very fond of Alidoro’s aria either). L’italiana does not have such slowness, it’s all upbeat. I think L’italiana appeals more to us modern folks because Isabella is a winner, is a woman with agency, who (for once!) goes to save the “damselor” in distress who was enslaved. And, in order to do that, she gets the help of another suitor! She rocks, she is irresistible. Angelina, in La cenerentola, is a much more traditional damsel in distress saved by a powerful prince. I think this is also why Cenerentola sounds more boring to us. Thank you for your expertise! I do agree about the final rondo in La cenerentola but that is usually all I can remember. It comes so late in the piece, it’s like Rossini’s Liebestod 😉 The duet – just now that you mentioned it, I kinda remember it – their interaction isn’t bad. But then, like you said, we have a properly independent woman with great arias and really funny lines that should be a dream role for a mezzo with comic skills. We need more of that on the stage! BTW, I am planning to go see L’italiana with #LaBartoli in Salzburg next Pfingsten! Can’t wait!! In Pfingsten? 😉 hm, maybe I will be able to make it, too… who knows, a long time away and lots of stuff at G-bourne. Maybe it’s marketing? The Cinderella story is familiar so it’s easy to seel. Especially to people who want to bring kids. That’s a very good point. I actually did not consider the family-friendly angle. we should pick a couple of L’italiana and watch together. i’ve always loved it and wished i had a chance to hear VK singing it live. she’d totally roll with this. and i’ve been meaning to drop this off, in case you’d like some quick entertainment. i like her left hand in particular, just when the 1st phrase ends (first she takes it out of pocket.. then flip.., hope you don’t get dizzy). haha, you’re right about dizzy!